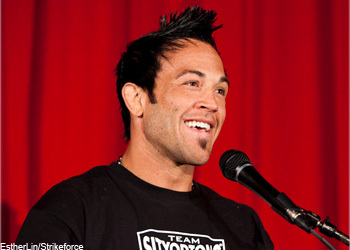 Strikeforce lightweight Jorge Gurgel was the victim of what clearly was a punch that occurred after the 1stRound bell. The left-hook went unpunished and the fight continued until the Brazilian jiu jitsu black belt was stopped only :19 seconds later, obviously still dazed from the unfortunate strike. The exciting 155-pounder didn’t blame the referee, the commission or KJ Noons, who walked away with his 10th MMA victory. Although, he was disappointed how the fight video replay was portrayed on YouTube. “The only thing that I really got upset with, it’s funny because I haven’t seen it yet live. I just now saw it, and then before then I had seen it on YouTube. Somebody from Strikeforce somewhere put it on YouTube and they delayed the bell like almost a full second. So it looks like the hit was immediately at the bell,” Gurgel explained. As you can see from the video above, the punch landed just as, or even slightly before, the bell rang. However, if you watch the scrap as it aired on Showtime, Gurgel was clearly hit after the horn sounded. It appears the flash knockout wasn’t the only thing that went wrong for the former UFC fighter. According to Gurgel, all the contestants that competed in last Saturday’s show were given a schedule that included a pre-fight drug test. “It said Friday after we weigh-in and after press meetings, everybody would be drug tested,” he recalls. “It’s funny because Friday after the weigh-in I went to eat something, I waited for the call and it was about 7 o’clock, which is the time we were supposed to (weigh-in). I get a random text from the Strikeforce higher-ups saying there will be no drug testing going on tonight.